To put it simply, the color of every planet in our Solar System is heavily dependent upon their composition. If it is a terrestrial planet – i.e. one composed of minerals and silicate rocks – then its appearance will likely be grey or take on the appearance of oxidized minerals. At the same time, the planet’s atmospheres play a large role – i.e. how they reflect and absorb sunlight will determines which colors they present to an external observer. The presence of an atmosphere can also determine whether or not there is vegetation, or warm, flowing water on the planet’s surface. If, however, we are talking about gas or ice giants, then the planet’s color will depend on what gases make it up, their absorption of light, and which ones are closer to the surface. All of this comes into play when observing the planets of our Solar System. Mercury is difficult planet to get good images of, and for obvious reasons. Given its proximity to the Sun, it is virtually impossible to take clear pictures using ground-based instruments here on the Earth. As a result, the only decent photographs we have of this planet have been taken by spacecraft, specifically missions like Mariner 10, and the more recent MESSENGER probe. The surface of Mercury is very similar in appearance to our Moon, in that it is grey, pockmarked, and covered in craters that have been caused by impacting space rocks. As a terrestrial planet, Mercury is also composed of mostly iron, nickel and silicate rock, which is differentiated between a metallic core and a rocky mantle and crust. Mercury also possesses an extremely thin atmosphere that is made up of hydrogen, helium, oxygen, sodium, calcium, potassium and other elements. This atmosphere is so tenuous that astronomers refer to it as an exosphere, one which neither absorbs nor reflects light. So when we look at Mercury, regardless of whether it is from the surface or space, we get a clear view of its surface. And what we have seen is a dark gray, rocky planet. The color of Venus, on the other hand, depends very much on the position of the observer. While Venus is also a terrestrial planet, it has an extremely dense atmosphere of carbon dioxide, nitrogen and sulfur dioxide. This means that from orbit, one sees little more than dense clouds of sulfuric acid and not its surface features. This lends the planet a yellowish appearance when seen from space, due to the cloud’s absorption of blue light. This image of Venus comes to us thanks to the many flyby missions that have taken place over the years. These include NASA’s Vega 1 and 2 missions during the 1980s, followed by the Galileo (1990), Magellan (1994), and the NASA/ESA Cassini–Huygens mission in the 1990s. Since that time, the MESSENGER probe flew by Venus in 2006 on its way to Mercury, while the ESA’s Venus Express entered orbit around Venus in April of 2006. The view from the ground, however, is a different story. As a terrestrial planet with no vegetation or natural bodies of water, Venus’ surface looks very rugged and rocky. The first images of the surface of Venus were provided by the Soviet-era Venera probes, but the true color was difficult to discern since Venus’ atmosphere filters out blue light. However, the surface composition (which is known to be rich in igneous basalt) would likely result in a greyish appearance. In this respect, Venus’ surface looks much like Mercury’s and Earth’s Moon. The color of Earth is one we are intimately familiar with, thanks to decades of aerial, orbital, and space-based photography. As a terrestrial planet with a thick nitrogen-oxygen atmosphere, Earth’s appearance comes down to the light-scattering effect of our planet’s atmosphere and our oceans, which causes blue light to scatter more than other colors because of the shortness of its wavelength. The presence of water absorbs light from the red end of the spectrum, similarly presenting a blue appearance to space. This leads to our planet having its “Blue Marble” appearance, along white clouds covering much of the skies. The surface features, depending on what one is looking at, can range from green (where sufficient vegetation and forests are to be found), to yellow and brown (in the case of deserts and mountainous regions, to white again (where clouds and large ice formations are concerned). Mars is known as the Red Planet for a reason. Thanks to its thin atmosphere and close proximity to Earth, human beings have been getting a clear view of it for over a century. And in the past few decades, thanks to the development of space travel and exploration, our knowledge of the planet has grown by leaps and bounds. From this, we have learned that Mars is similar to Earth in many ways, which includes similarities in composition and the existence of weather patterns. Essentially, the majority of Mars is reddish-brown, owing to the presence of iron oxide on its surface. This color is also quite clear thanks to the rather thin nature of the atmosphere. Nevertheless, the occasional cloud can also be seen from orbit. The planet also has its share of white patches around the poles, due to the presence of polar ice caps. Jupiter is famous for its banded appearance, consisting of orange and brown intermixed with bands of white. This is due to its composition and the weather patterns that are common to the planet. As a gas giant, the outer layer of Jupiter is made up of swirling clouds of hydrogen, helium and other trace elements that move at speeds of up to 100 m/s (360 km/h). At the same time, the color patterns of orange and white are due to the upwelling of compounds that change color when they are exposed to ultraviolet light from the Sun. These colorful compounds – known as chromophores, and which are likely made up of sulfur, phosphorus, or hydrocarbons – are formed when rising convection cells form crystallizing ammonia that masks out these lower clouds from view. The most detailed image taken of Jupiter was constructed from images taken by the narrow angle camera on-board NASA’s Cassini-Huygens spacecraft, which allowed for a “true-color” mosaic to be created. These images were taken on December 29th, 2000, during its closest approach to the giant planet at a distance of approximately 10 million kilometers (6.2 million miles). Much like Jupiter, Saturn has a banded appearance that is due to the peculiar nature of its composition. However, due to Saturn’s lower density, its bands are much fainter and are much wider near the equator. Like Jupiter, the planet is predominantly composed of hydrogen and helium gas with trace amounts of volatiles (such as ammonia) which surround a rocky core. Saturn’s finer cloud patterns were not observed until the flybys of the Voyager 1 and 2 spacecraft during the 1980s. Since then, Earth-based telescopy has improved to the point where regular observations can be made. The greatest images to date were taken by the ESA’s Cassini-Huygens spacecraft as it conducted multiple flybys of Saturn between 2004 and 2013. As a gas/ice giant, Uranus is composed largely of molecular hydrogen and helium, along with ammonia, water, hydrogen sulfide and trace amounts of hydrocarbons. 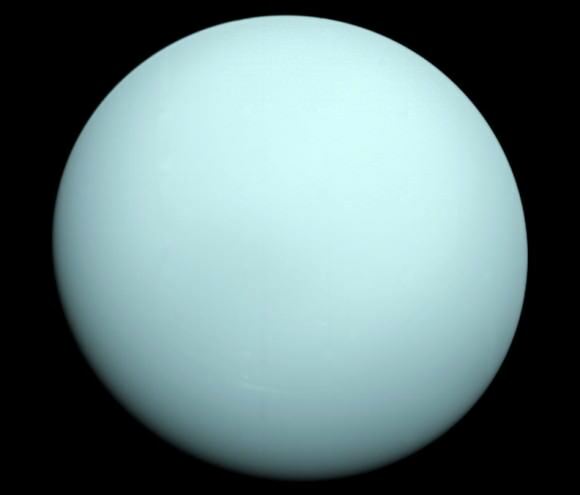 The presence of methane is what gives Uranus its aquamarine or cyan coloring, which is due to its prominent absorption bands in the visible and near-infrared spectrum. To date, the only detailed photos we have of Uranus were provided by the Voyager 2 interplanetary probe, which conducted a flyby of the system in 1986. It’s closest approach occurred on January 24th, 1986, when the probe came within 81,500 kilometers of the cloud tops, before continuing its journey to Neptune. Neptune is similar in appearance to Uranus, which is due to its similar composition. Composed mainly of hydrogen and helium gas, this gas/ice giant also has traces of hydrocarbons, possibly nitrogen, and “ices” such as water, ammonia, and methane. However, Neptune’s higher proportion of methane and ammonia, along with its greater distance from the Sun (which results in less illumination) is what leads to Neptune’s darker blue color. Compared to Uranus’ relatively featureless appearance, Neptune’s atmosphere has active and visible weather patterns. The most famous of these are the Great Dark Spot, an anticyclonic storm that is similar in appearance to Jupiter’s Great Red Spot. Like the other dark spots on Neptune, this area is a darker shade of blue compared to its surroundings. Like Uranus, Neptune has only been photographed up-close on one occasion. Again, this was by the Voyager 2 spacecraft, which made its closest approach to the planet on August 25th, 1989. Although the photographs it took were color-enhanced, they managed to capture Neptune’s deeper blueish color. As our exploration of the Solar System continues, our understanding of it continues to grow. In time, this knowledge will advance further as we begin to mounted crewed missions to planets like Mars, and additional robotic missions to the outer Solar System. We have written many interesting articles about the Solar System’s planets here at Universe Today. Here’s our Solar System Guide, Order Of The Planets from the Sun, What Is The Atmosphere Like On Other Planets?, and Some Of The Best Pictures of the Planets In Our Solar System. If you are interested in the colors of planets, you may also want to check out the color of plants on other worlds and the planets’ true colors. Astronomy Cast has episodes on all of the planets, starting with Episode 49: Mercury. I’ve wondered this about nebulae for a long time. I felt betrayed and heartbroken the day I learned that pictures of nebula were almost exclusively color-enhanced. 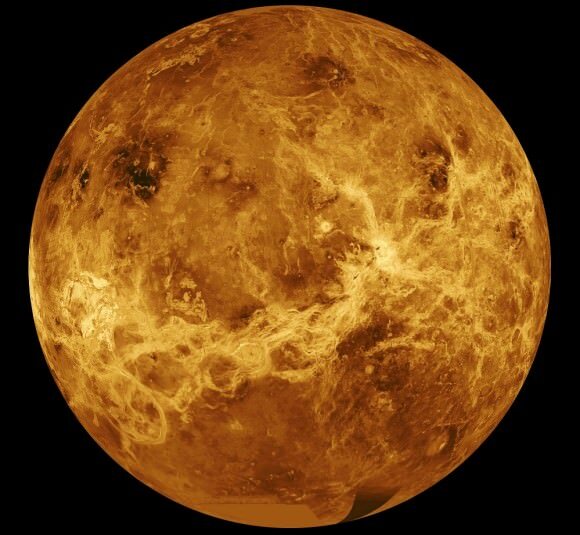 The choice of a radar ‘image’ of Venus, cloudless and false-colored instead of a visible light, cloudy photograph is surprising, given the article theme. Since when has Cassini been a ESA and not NASA mission? Just the Huygens lander was contributed and operated by the Euros, not the whole Cassini spacecraft. Note that human eyes are not very sensitive to color under low light levels, nebulae are intrinsically faint. Enhanced does not mean “false”, just “enhanced” to compensate. Photography itself is not “natural”, but technology attempting to reproduce “reality”.